Our primary teaching tool for learning this method is the Leg Press. We use this tool because it is relatively easy to learn and it is perhaps the most productive exercise in a program. If taught with great detail it will provide the ground work for more difficult exercises. With that being said, it makes sense to use this exercise to illustrate performance objectives. So far I have noticed that video does not necessarily give the same appearance as it does in person. Gus Diamantopoulos used to work and study film production and he has given me some ideas on how we can enhance the visual impact of these demonstrations. I have not been able to shoot any video with these recommendations yet, but I do think we will be able to better demonstrate as we learn. In the meantime I wanted to show another Leg Press video. This video may give you some ideas of what to look for and show you how the set can evolve with proper instruction. I would NOT be able to perform at this level (load and quality) without instruction and without feedback. I do not believe training with a single set done to failure is productive unless it is done this way. 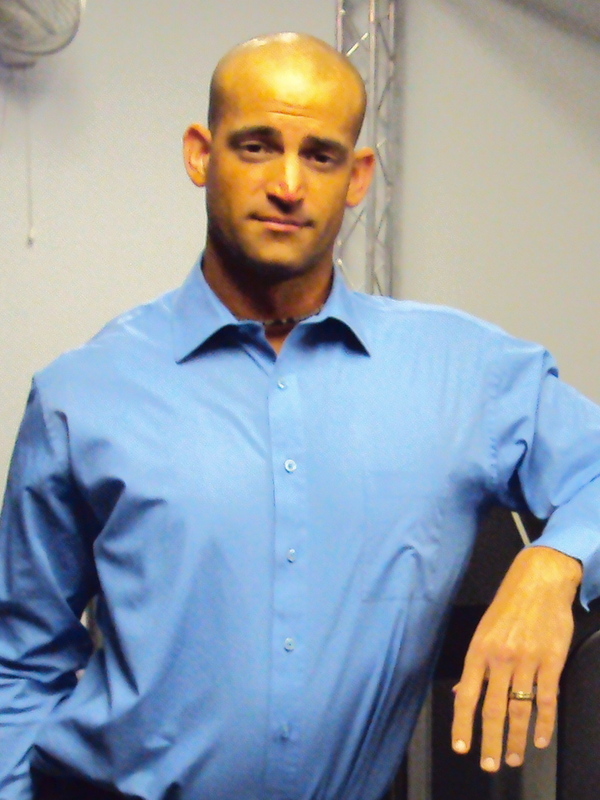 “In the Leg Press video Al is applying force, as gradual as possible, to engage the load. Assuming one is making an effort to eliminate all of the stored energy on the turn around; an advanced subject will be working near peak efforts by the third rep. I actually shot some video of this same exercise yesterday. By the third, fourth and fifth reps you witness me struggling to do what I can, in order to prevent the tempo from slowing down even more. By this point, it is evident that the performance has NOTHING to do with trying to go slow – it is me trying to hurry up so I don’t bog down even more. I did not complete the entire positive excursion of the last rep (the 5th rep). I actually reached failure when my knees are nearly straight. In spite of my best efforts, and Al’s instruction, I could not complete the last one inch of the allowed R.O.M. This is very rare as it is expected that we would be exceptionally stronger as our knees get straighter and as our levers become more effective. This is the only exercise that I’ve ever done where I fail in that part of the R.O.M. (Interesting side bar: Nautilus went to great lengths with their Negative Cam in the Duo Squat machine to attempt to produce the effect I’m getting here.) The final negative becomes an all out war to keep it from running away. When you perform exercise this way you will immediately understand that machines that hyper-load the negative are not only unnecessary, but also counterproductive and extremely dangerous. This becomes very clear the first time you experience this level of fatigue without any opportunity for respite. Hyper-loading the negative is attempted to cover up poor cam effect, friction, and momentous performance. There is much more to say about this subject for another post. It may or may not be obvious that with the gradual application of force and the magnitude of the load there, but there is about a six second delay between the time when I start to push (note that the breath sounds correlate to the application of force) and when I overcome the weight stack and the sled begins to move. Renaissance Exercise promotes maximum efforts, but force application should be as gradual as possible. As fatigue sets in you will be pushing as hard and as fast as you can in order to stay in the running. As always, please share your thoughts and comments below and we will personally address them! This makes sense considering the duration of this exercise exceeds the cumulative time for “typical” multiple sets. Someone performing 3 sets of ten at 2 seconds up and 2 seconds down, is performing 2 minutes of TUL. The one set demonstrated (2 and 1/2 minutes) was more volume than the “high volume” workout. Defintely no need for another set. Yup. We build the volume and work capacity into a single set. After this a person can’t and would not want to perform another, and if they could they didn’t do it right the first time. Do you recommend pauses at the end points of the movement? For the purpose of muscle fatigue, would not a more continuous movement without pause at end points be more advantageous? Avoiding lockout positions in pressing movements could possibly assist in this pursuit? I agree. Renaissance Exercise does not promote a pause in any position. There are no pauses on the Leg Press. Both turn-arounds are a continuous loop. The reason you don’t see movement on the upper turnout from the 3rd rep on is because there is a hard end-stop which we amplify against. The instruction when the subject abuts the end stop(from the 3rd rep on) is “Squeeze (amplify), un-squeeze, ease out of that position. This is a crucial instruction and it makes the exercise much more intense, note the rate and frequency of respiration on the upper turnaround from the 3rd rep on, this will give you some indication of what’s going on metabolically. I very much agree, if one were to “pause”, we would start to see recovery from the set. Now realize that near the top of the 5th attempt, I’m pushing as hard and as fast and as I can yet no movement occurs. My instructor (Al) says “there is another inch left!”, hurry up!”. There is certainly no pause here either. I just do not possess sufficient strength to overcome the load anymore. Which rarely happens in this position, but makes for interesting study. Again, this may be hard to see without the end-stop reference in frame, but if you look careful you can see that the degree of knee extension is less. This is an excellent question and a perfect example of why I posted this video, I want people to be able to dissect a performance and figure out what is REALLY going on besides what they see on the surface which is a machine moving slow. Great job Josh … bending that deep at the bottom turn-around and not straightening the legs that much at the top turn-around really make that Leg Press exercise a killer on that machine .. way to hold it together most of my clients would puke if they had to do it like that. Is there an ideal TUL “window” for RenEx.? Judging from your videos and workout schedule (3-6 reps), it seems to be 60 to 120+ seconds. Thanks again for sharing! I’m not aware of an ideal, if there is I haven’t been able to locate it. We actually don’t even track that way. Based on my average rep range 3 to 6, and protocol ranging from about 8/8 to 12/12 it’s looking like I’m USUALLY between 48seconds and 144 seconds. Not so specific huh? I would say program design should be built in such a way that you spend time at either end of the spectrum. With new subjects higher, I would never let a newbie come anywhere near as low as 90seconds. Remember this is a discipline, the threshold, intensity and ability to inroad cannot be mastered if rushed, trying to get to these supposed hypertrophic ranges. I hear a lot of complaints that we are outside of some sort of magical hypertrophic range. I believe that when people say this are trying to blend paradigms. I don’t think that T.U.L recommendations for conventional training are applicable here. Most systems build volume and work capacity with a multi-set approach. Josh … regarding the retrofit done on that leg press does your machine have the top plate with 2 or 4 bearings? Do you have the two Teflon inserts (bushings) in each weight stack plate? 4 bearings spaced a specific distance. Teflon all the way through on retrofit stacks. Our new proprietary weight stack will cut down on much of this. Greatly enjoy your constructive approach to training, but I have concerns about physiological adaption/progression and orthopedic issues. As in most training rituals, there will be initial gains due to the new stimulus and then as ones physiology adapts there are needs of a new element to promote further gains. Other than load increases, what would be your approach to new stimulus? Perhaps you feel that load changes are sufficient? Does the limited number of exercise devices restrict the opportunity to provide new training elements? Also, could using higher loads with high tension in a restricted movement/machine environment if used chronically lead to possible joint disorders? I was also wondering about your feeling that doing one set with your protocol with the long time under tension would equate to the same volume of actual total work as a higher traditional bodybuilding regimen. Isn’t there a difference in the actual mechanical stimulus with the many turnarounds/etc. that occurs with typical bodybuilding program that is not provided with your protocol? Getting too long winded but if the goal is applying quality time under tension, then I believe one the Japanese studies found that a protocol of 3/3 produced a near flat EMG signal which the authors thought was a sign of quality tension. Perhaps going slower is slightly over egging the pudding? 1. We have over 60 pieces of equipment here, so limited is not really in our vocab. Also to a degree, the stimulus will come from the subjects ability to access more muscle as they adapt to the machines curve. Inroad is cam dependent for the most part. I don’t see this as a point that one reaches and then moves on from, but an evolving and ever deepening process. 2. Once again, the speed of motion is determined by a combination of joint velocity and the accomidating nature of the apparatus. We aren’t trying to fit in a cadence box, but you have to start from somewhere to test. Al, I misunderstood the equipment usage and thought that there was a limited number of machines that were adapted for this protocol and these were the exclusive tools. When I and others were using the old double blue Nautilus equipment more years ago than I like to remember, we noticed after a couple of months some orthopedic issues and found some remedy by altering hand/foot positions. Constant loads in a fix position can produce some issues. I do enjoy your creativity in doing different velocities based on the character of each movement. I am still a little confused about progression. After the trainee has mastered the cam profile and performs the protocol properly, is the progression exclusively through load? Have you considered videoing a series of trainees performances over time to see how reproducible/consistent the protocol would be maintained? great intensity and form. However, in my opinion the TUL is way too long. 3 minutes on the leg press is about 90 seconds longer than it needs to be. Are you moving the weight that slowly because its that heavy or are you intentionally moving that slow to fit in the context of a 10/10 cadence. I have found that you move that slowly because the weight is so heavy you can’t move any faster. If the weight is so heavy your forced into an extremely slow cadence you’ll never make 3 minutes on any exercise. Thoughts? Watching the time lapse, the set begins 7seconds in, positive excursion ends at 2min 21seconds. That is 2min and 14seconds or T.U.L. Right where I like to be on that exercise. In general, I’m guessing our load times will usually be a good 30seconds longer than the other sstf protocols, but if it results in much deeper inroad, and assuming we are comparing apples to apples- single set to failure. Then….wouldn’t this be time well spent? Considering the first rep (and maybe the second) provide a self-admitted warm-up, if you subtract the TUL of the “warm up”, the working (high effort) portion of the set coincides with the generally accepted TUL for hypertrophy. EXACTLY!!!! The idea of warm up has been so misconstrued that the whole topic really needs to be reconsidered. No athlete who participates in an activity that requires the reqruitment of the higher order motor units would ever try to go at it cold. What is NOT needed if force is applied gradually is an EXTRA warm up, but there is still “ramp up” time needed. All of the research that shows different load times being responsible for different types of adaptations has been done with protocols that involved extra sets and “warm-ups”(with the exception of Westcott’s stuff, which I don’t like). Besides the fact that most of this research is bunk, it is done in a different paradigm and may not be applicable to what we are doing. That’s possible, but what Josh and I are seeing is that everyone seems to have a different speed in which they are able to go through their “gears”. For example, Josh and I have put ourselves and others through timed static tesing on David equipment and have both noticed that it could take upwards of 90 seconds before someone is capable of actually hitting their peak torque. What we have seen is that if someone really wants to cycle through everything, the “ramp up” time may vary. No one knows. Physiology texts are repleate with so called proven windows, but these are all based on crudy studies with crudy tools. The technology to really meausre this stuff is not too far away. I understand what you are saying, but in my recent experience I have seen that within a certain context TUL is irrelevant. TUL is a quantitative measurement and doesn’t measure quality or depth of inroad. If anything it measures a subjects willingness to avoid it! The biggest problem I have seen with the trend of “make it so heavy that it won’t go any faster” is that it turns folks into what I like to call “Furniture movers”. People are literally “walking” weights from point A to B slowly without any real direct inroading. It is my speculation based on my recent progress that this is why most feel they can only train once per week. They are distibuting the load so globally that they turn every exercise into some sort of wrestling match. It is why so many people have that “run over by a truck feeling” the next day. My recent experience has shown just the opposite(to a degree). I experience direct soreness, but hardly any “wasted” feeling. I’m training twice per week and have gained a good deal of muscle(11 pounds to be exact) since July. I attribute this to getting better and better at the skill of producing a more direct inroad(while keeping the stress less global). I’m going to write about this in more depth, but we have to be very careful to not equate resistance and muscular load in a one to one relationship with machine load. I know you feel that in my own vids the reason for my stoicism was because I wasn’t using heavy enough weight, I can assure you that is 100% false. Josh can attest to this. I’m stoic not because I’m trying to be, but because I’m so concentrated on keeping up the rate of speed that I don’t have time to make stupid faces. Josh has seen me stack Ken’s pulldown without breaking down. There is a point in me explaining this. I sense the “key” stimulus at this point relies on the willingness to develop one’s “low gears” first through such things as PROPER “squeeze” technique, rate of movement cues, and other qualitative things that teach a subject how to actively “empty out the gas tank” with more directness and efficiency. The whole point of Renaissance Exercise is to actively pursue answers to these questions, because no one has ’em yet. Al is capable of using more load, with more precision than any person I’ve ever seen. We call him a ALPHA PRIME subject. Just watching him train has made me better. 11 pounds, eh? I thought you were looking a bit thicker in the overhead press vid. Keep it up! Thanks man. I think much of my progress has had to do with three major things. One, Josh has been able to make my work situation stress free and fun again. Two, we feed off each other and seem to come up with new things to focus on daily which in turn makes me train harder. Three, equipment. I could be wrong but I believe that in Mcguffs first book their was a mention of 90 seconds as an ideal TUL.I would allow a minimum of no less than 60 seconds & no more than 2:00 as the slow twitch fibers are able to recycle.so if we use 1:45 plus or minus 15 seconds I think we can settle on this as being a standardized ideal TUL.Under 1 min decrease load over 2 min increase load. I’m not aware of this. Hey over fifty fitter you might gain insight into the ideal velocity by studying the Force Velocity Relationship as pointed out by Physiologist A.V.Hill which I quote “as the speed of muscle shorting increase the force exerted by the muscle decreases”,and to quote physiologist Richard Liber from Skeletal Muscle Structure,Function,& Plasticity,Second Edition,The Physiological basis of Rehabilitation ,” The take-home lesson is that as a muscle is allowed to shorten.Force drops of precipitously. (page 62).This has nothing to do with “egging the pudding” it has to do with physics & physiological laws of nature. thanks for the reply. I’m all for doing something better and getting better results. As you know I trained with Rob for years with ideal equipment and he can tell you I did exactly as I was told. Deep concentration very slow movements, very long time on each machine 2-3 minutes. Extremely demanding and left me hammered for days. What do you recommend I do? At almost 52 years of age, I’m interested in keeping what I’ve got. I’d guess my days of adding muscle are behind me. Also, the last time I saw you, over a year ago, you were recovering from lyme’s disease, which left you extremely thin. Wouldn’t adding those 11 lbs you’ve added come from the fact you’ve recovered and reaching your “normal” weight. I’d like to come up there and learn/re-learn what your experiencing. Please advise. I wouldn’t correlate age with not being able to build muscle mass, not at all. I’m an “amateur” here but I ‘m a voracious reader and having been doing slow burn workouts for 4 1/2 yearss now. I’m a 48 year old female and my body continues to IMPROVE WITH AGE! It’s really amazing. That Mack truck feeling isn’t there as much at all if you continuously keep hyper-hydrated, per McGuff in a post he did in December. Chins up! Hey Greg this is Bert & I’m turning 47 on New Years Day.Since this site has gone up & I saw Al’s knee extension video & read Gus’s ” Slow,Hard,& Fast I have been motivated to inroad deeper & my quadriceps have hypertrophied.Al will tell I have decent legs & the day I don’t think I can improved I will quit.A great deal of Low Velocity High Tension Exercise is psychological,keep a positive attitude & look to stimulate & produce the growth. Josh, Great work on your leg press video. What I really like is how deep you go. I realize how difficult this is while keeping from unloading. I’ve been around facilities for a long time now and very few do anything near rull fange. Al, I have showed your lex ex video vs Hahn’s to many to demonstrate what full range and intensity really is. For my last 30 plus years of the old Nautilus 2/4 to 10/10 is peoples perception that slow means “LIGHT WEIGHT” as in a warm up. Then increase the weight and throw it up and drop it down as fast as possible. As if it was the athletic event that they just watched on TV. It’s very hard to convince people to use heavy weight and lift slow and controlled and continue throughout a full range of motion. Bizzare how people will take on the endeavor and give zero thought to the process. Even people who are supposed to be engaged. It’s really quite simple we are using tools and protocol to assure that the only thing engaging the load is pure muscular effort, Reducing the effects of momentum, non-muscular body torque and skill. Pure, intense muscular work! That’s what we promote and design technology to enhance…. Another great video example……loving the Elvis impression with the legs from rep 3 onwards!!! I’m very familiar with the leg shaking on leg press and its a very clear clue as to what is going on both on a muscular level and metabolically, you did a great job to hold it together Josh as most people usually quit at that point…. That’s where all of the GOOD STUFF starts. After reading and watching the videos, I can see the importance of mental preparation and focus (Zen Effect) before and during your workout. As Josh stated, Ren.Ex is a “system ” that can take years to master. I believe this to be true since one must develop a synergy of the physical and mental aspects of Ren.Ex. This has always been a major reason I enjoy slow training.For me, the slow mvmt. allows my mind to “tap into” every rep.
Is the mental preparation and focus a major part of your instruction? I’d say mental prep is a big part of my instruction. I’m going to present a few blog posts on this in the ensuing weeks. I look forward to your thoughts on this topic. I always get to my workout about 20 minutes early and sit in the car for 10 minutes (in a place where my trainer can’t see me so he won’t think I’m a total geek). I visualize myself on the different machines (and I don’t let it me throw me off if we don’t do that one that day) and I try FEEL my rapid breathing and I say to myself that I’m grateful for my muscle sensation and that my body has NOTHING TO FEAR and that it is okay push through the pain, that my body can handle it and that my mind can climb the mountain and my muscles will carry me. I keep open to my experience, sensations and the feeling. I don’t intellectualize at all when I am strapped into the equipment. I begin each machine with me and I end each machine with me and my instructor – he has a very precise blend of knowledge, respect (for me and the process) and intuition – it’s really amazing. He’s not even been doing this very long, only five months – but he is so good. I think that there’s something to having the right trainer for the right person. I have ADD and he knows how to check my “wiggle worms” at the door! I’d just say relax and don’t be all uptight for the workout/hunt (I can be a pretty anxious gal). Make it NATURAL. Go get that mountain lion because you NEED DINNER – it will only take a few short bursts of FOCUSED energy…and “voila” you’re there! I’m not Josh or Al,but I’m usually focusing on my upcoming workout hours before it takes place.Just setting up my equipment for the workout can cause my heart rate to increase by 40 bpm.I love it! I also treat the workout as an event. My heart rate is elevated for quite some time pre and post workout. Great video! again a picture is worth a thousand words. After 40 plus years of training my training has been revitalized by this site. The idea that this type of training is a system that takes years to master adds purpose to training at age when the training response can deminish to degree that can be disheartening. The increase in intensity in my workouts has been a direct result of adopting the guiding principle to do everything I can to get to failure in a shorter time WITHOUT resorting to an increase in weight until it is absolutely neccesary. Do you think the “average” trainee has the discipline, patience, concentration, pain tolerance, etc to benefit from this protocol? You’ve mentioned the mastery of the protocol taking years. How do you sustain the average client, who may not realistically ever achieve said mastery? Good question again. The funny thing about mastery is that it is not really acheiveable. It is a process of ever deepening learning. This is actually what “grabs” our clients for life. The average trainee does possess it, but without proper instruction and good equipment(should be one in the same, but rarely is) it will remain latent. I think what Josh was refering to is the individual that tries to go it alone. Expert instruction definitely speeds up the process. Our aim is to help make this broadly applicable. You can’t ever under-estimate the power of someones else’s mental fortitude or internal will power. The relationship of the trainer/trainee can often times be positively synergistic! P.S. Maybe everyone is average till they are shown other-wise! Change body change mind or visa versa. Have you experimented with faster negatives on the intial reps? I’m guessing the trainee possesses enough strength to control the negative faster than I’ve seen demonstrated in the videos. Wouldn’t speeding the intial few negatives up a bit lend to the ‘failing as fast as possible’ goal? You mentioned elsewhere that the later negatives will “run away” if not performed so slowly. I get that; what about the early ones? Interesting and well thought question. This would probably work with less than optimal equipment. This is the way the protocol was originally. 10/5. However, it won’t work with our current equipment. We do usually coach the trainee to “speed up slightly” during the negative, but that is to ensure they aren’t resting and to ensure they maintain the rate of movement. The nature of most of our machines(which is necessary) would result in an almost uncontrollable drop if the subject goes any faster than a “slight” speeding up. Leg press exercise requires your feet to be fixed on secure footboard so that loading of the musculature can be experienced continuously. Ideal footwear for leg press demands specifications almost diametrically opposed to running. 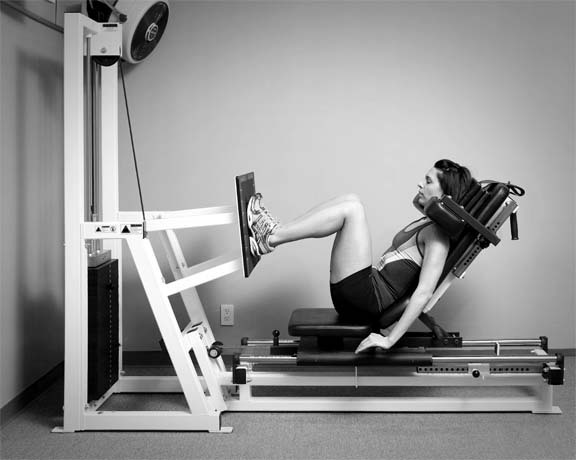 During leg press, your footwear should provide for the efficient transmission of power between the movement arm of the machine and the footboard. In other words, force produced by your muscles should contribute to moving the resistance and such movement must be controlled throughout each and every moment of each and every rep. A running(or walking) shoe’s compressible sole between your foot and the footboard will behave inconsistantly during each rep as to alter the pattern of force transmission every time; imagine giant marshmallows under your feet. This makes the intended subtle behaviours of proper form increasingly difficult to perform. In fact, the more ideally suited the shoe is for running(or walking), the worse it is for leg press. Your ideal workout shoe needs to be well-fitting and have a non-compressible (or minimally compressible) rubber, neoprene, or gum sole. Ideally, the sole will be reasonably thick.